Who knew wine sealing methods could be so interesting? To Cork or Not to Cork is a fascinating account of the wine cork in all its glory and shame and the many competitors trying to replace it as the preeminent wine closure. Who will win the ultimate race between cork, plastic, and screwcap? Taber examines each of these elements from all angles including the three in the title itself; tradition, romance, and science. Interestingly it is on the science front that no clear winner emerges as each study noted contradicts another and then is itself contradicted. This wine book is almost a page turner; full of interesting facts, history, perspective from key wine personalities, and the occasional cover-up and scandal to keep things spicy. This wine book is recommended for anyone looking for a good read on something too often taken for granted and overlooked by the wine drinker. 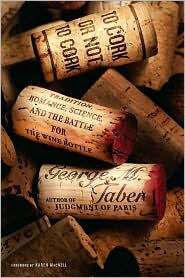 Fascinating read that will bring a new level of appreciation to the wine cork.